So we had a total of two trick or treaters. Which means lots of leftover candies. What a shame. Halloween is over, friends, which apparently means now that we all storm head-first into Christmas. Good lord. It's already happening. I walked into Target (SHOCKER) and there was a massive, green and red and purple and gold GLITTERY sign that proclaimed, "All is merry and bright!!!". Now don't get me wrong. I am all about some Christmas, tidings of great joy, family, food, presents, snow, rocking out to Mannheim Steamroller. Sign me up. But let's give it a week or two, right? There was also a massive display of Christmas candy. Eyeing this tempting collection, I booked it for the household cleaning aisle, safe and far from chocolate urges. I just ate 747436 pounds of Halloween candy in the spirit of "What the heck, it's just for Halloween". This is greedy, folks. Greedy. 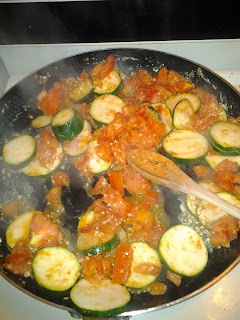 To detox, I concocted a delicious zucchini, tomato and canned chicken entree. Now, I know what you are thinking. Canned chicken? Isn't that nasty? Doesn't it have the texture and appearance of albacore tuna? And yes, all three of those things are true. But we have hurricane food left over, and waste not, want not, I always say. That chicken will be going bad soon (expiration date 2099) and also I forgot to defrost actual fresh chicken. THE POINT IS that I improvised ratatouille and it was very easy and fresh tasting. Cooked it up with olive oil, salt, pepper and garlic and gave it to K, who ate it despite the canned chicken, something I love him for. It's like Julia Child up in here, I tell ya. In other news, I've decided to participate in National Novel Writing Month. The goal is to write a novel in a month. 50,000 words. It's, obviously, a rough draft at the end, but the brilliance is that it gets you to actually write the book. Which, despite the fact that every published author I've ever met/read has insisted is the best/only way to ever get published, I have yet to do. So here it is. In writing. I am embarking on this journey of 50,000 words, and will see it to the end. DONE. They say to make yourself accountable, and so I am going to make myself accountable here. Every day, I will write an entry here, and update my word count and status. I also promise that it will take up no more than a few sentences, because really, unless/until it's published, who cares? I leave you with the video that has dominated my evening.